Unless Russia and India’s interests are directly threatened by the Islamic State, they should stay away from the quagmire created by Washington’s reckless and foolhardy policies. Our friends in America never learn their lessons. 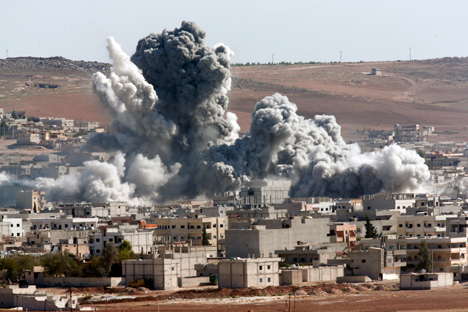 It feels like déjà-vu when we see the Islamic State exerting its powers in Syria and Iraq. There are parallels to how a stable and relatively prosperous Afghanistan was turned into rubble by U.S.-sponsored jihadis, who first fought the occupying Soviets, and then formed the Taliban once the USSR withdrew. Those who want an idea of how Afghanistan was before Messrs Zbigniew Brzezinski, Jimmy Carter and company decided to ruin the country should read Khaled Hosseini’s fine and eye-opening novels, The Kite Runner and A Thousand Splendid Suns. We are witnessing a similar situation in Middle East now, with American-armed and inspired militants forming the Islamic State of Iraq and Syria. It’s no wonder that Vladimir Putin said that everything America touches turns into Iraq and Libya! Before God told George W. Bush to “end the tyranny in Iraq,” the Arab country was no paradise. In fact it was an authoritarian and oppressive state, but it was secular, stable and posed no threat to its neighbours after its misadventure in Kuwait. The 2003 illegal invasion of Iraq and subsequent occupation of the country by the “torchbearers of democracy” only plunged it into turmoil and set the stage for the creation of one half of this Islamic State. The second half of this terrorist organisation was formed when the Americans and their allies in the Gulf decided that “bad man Bashar Al-Assad” had to go. While the Syrian leader was not as much of an international pariah as Saddam Hussein, he remains an authoritarian leader with no tolerance for dissent. That did not give America the right to arm and train militants to overthrow the legitimate Syrian regime. The American intervention in a relatively stable region has ended up in creating a barbaric monster like the Islamic State that tortures and beheads enemies and sells captured women in slave markets! Now we hear that the U.S. wants to arm the good rebels in Syria to fight the ISIS and the ruling regime. Such logic is the reasoning behind the existence of this Islamic State in the first place. This monster using American weapons now poses a threat to its former benefactors, all allies of Washington. Let these forces of freedom clean up the mess they created. It’s heartening to know that countries like Russia and India did not volunteer to assist the U.S. in its operation to crush the ISIS. The former’s main interest lies in defending its naval material technical support point in Tartus. The facility is of vital importance for Russia and one of the fringe benefits for the U.S. to have a puppet regime in Syria would have been the eviction of the Russian Navy from Tartus. India managed to evacuate its nurses from ISIS-controlled territory in Iraq and hardly had any nationals in Syria. Although there have been statements that the terrorist group wants to attack India, it is highly unlikely. The Islamic State would have to defeat Iran and Pakistan just to come within striking distance of India. Such a scenario looks next to impossible at the moment. Russia also has a strong buffer from this terrorist group, which would have to cross Iran to enter former Soviet space. When it comes to the Islamic State, the greatest danger that Russia and India face is the possibility of radicalised youth joining this outfit. Of course, it’s only people in the lunatic fringes of Muslim society in both countries that would even think about fighting with this terrorist group. It’s important for the intelligence agencies of both countries to keep an eye on those with leanings to this group and deal with them using an iron hand if there is even a hint of them joining the Islamic State. It’s only if the United Nations sanctions air strikes or ground attacks on the Islamic State should New Delhi and Moscow even think about getting involved in this mess. Given the fact that the world body’s members rarely see eye-to-eye on any global issue at the moment, a UN mandate is highly unlikely. Countries that bend over backwards to do Washington’s bidding for it often end up facing the greater wrath of America’s enemies.